Returning from the mysterious land of "where have they been all these years" is England's Power Quest. The band was formed by original Dragonheart (aka Dragonforce) keyboard player Steve Williams back in 2001. Five albums were released between 2002 and 2011's Blood Alliance. Even so Power Quest, through years, has dealt with a revolving door of personnel changes, with band dissolving in 2013. 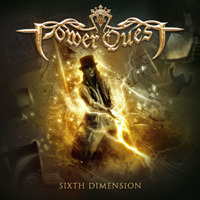 Now Steve Williams revives Power Quest with another new line up for their sixth album, appropriately, Sixth Dimension. For the uninitiated, Power Quest plays traditional melodic heavy power metal which means you probably know the formula: twin guitar harmony in riffs and leads, clean, harmonic, and melodic vocals arrangements, both rock groove and gallop from the rhythm section, and then a portion of keyboards. Being a band lead by a keyboardist and songwriter, the keyboard presence are significant within the Power Quest sound. Steve William's synths go beyond mere symphonic atmosphere to include deeper accents and strong solos. If you think the synth presence should relegated to the role of background embellishment, then you'll probably not like Power Quest. Being a guitar guy, I could feel that way, but Williams' keyboard lines are both definitive and pleasing. Finally, in the song arrangements, Power Quest has the ability to include both rock groove and AOR accessibility in their tunes, notable in the catchy No More Heroes or Pray For The Day. Otherwise, most of the songs here are melodic heavy metal tunes amped up with power metal gallop. Revolution Fighters, Lords Of Tomorrow, Kings and Glory, and Face the Raven are large charging power metal songs with lots of key and guitar solos. Alternatively, the composition of the final song The Sixth Dimension dials back on the speed offering a moderate pace with a smooth rock groove, and features Anette Olzon, formerly of Nightwish. Essentially, then, Sixth Dimension is simply a return to form for Power Quest. Not missing much of a beat in six years, Power Quest sill delivers entertaining melodic power metal. Recommended. Sixth Dimension is simply a return to form for Power Quest. 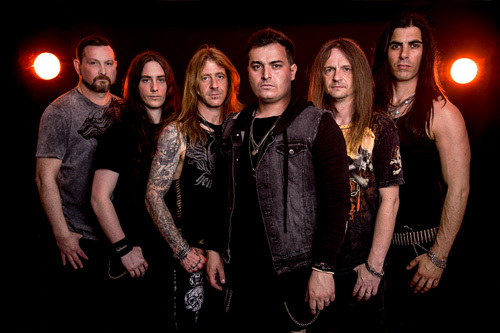 Not missing much of a beat in five years, Power Quest sill delivers entertaining melodic power metal. Recommended.